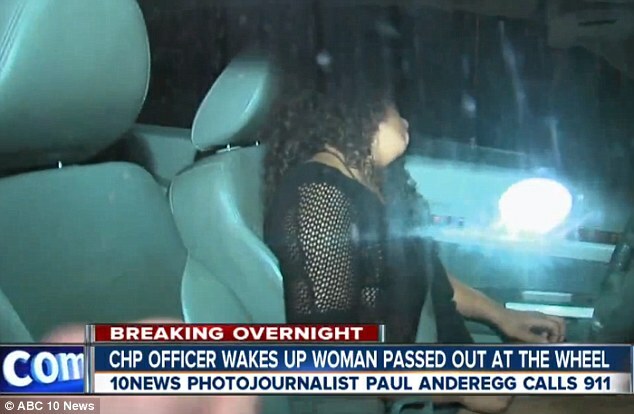 A San Diego woman who was shown on TV allegedly drunk and passed out behind the wheel of her car in the middle of Interstate 805 pleaded not guilty Friday to misdemeanor DUI charges. Amber McKinney Morgan, 25, was not in court and entered the plea through her attorney, Gerry Braun of the City Attorney’s Office said. A readiness conference was set for June 3. Morgan was seen in a stupor in her sedan, which had stopped in the number three lane of northbound 805 under the Clairemont Mesa Boulevard bridge at 1:45 a.m. on March 27. As traffic sped past, CHP officers were seen risking their lives to break open a window and get Morgan out of her vehicle. A witness tried to awaken Morgan and called 911 for help as he recorded the unfolding drama on his cellphone. A CHP officer, identified as Sergio Flores, darted onto the freeway to first try to awaken Morgan then break a window, but was unsuccessful. After a second CHP officer blocked traffic, Flores was able to break a passenger-side window with his flashlight. Morgan was removed from the car and walked to a safe location. After her rescue, Morgan was arrested, booked into jail, and later posted $2,500 bail. Morgan was identified by 10News as a San Diego State University student and an aspiring journalist. A bottle of vodka and a mixer was found inside her car, according to the station.